After months of feeling exhausted, Tim decided it was time to see his doctor when he fainted at school in front of a class of unforgiving 16-year olds as he was teaching them GCSE maths. “I expected to feel tired – it was coming up to exam time and there is a lot of extra work. I was also running around after work looking after my elderly mother who had had a stroke earlier in the year, but the collapse really worried me,” he explains. After listening to his heart beat, the GP told Tim, rather abruptly, that he would have to be admitted to hospital straight away as he had bradycardia – a slow heartbeat. “He said my heart was beating dangerously slowly – I think he was rather shocked and his usual bedside manner deserted him as he knew this was a serious emergency. I was taken to hospital in Leeds by taxi ambulance as I was still able to walk and I actually didn’t feel too bad,” says Tim. Bradycardia, defined as a heart rate of less than 60 beats per minute has all sorts of different causes. It can occur after a heart attack, because of a congenital heart problem, because of the side effects of drugs or because of scar tissue from a heart attack. Tim had had none of these, as far as he knew, but a slow heart rate can also arise because of the natural ageing of the heart tissue. The natural system that keeps the heart beating at the correct rate becomes less efficient with age and sometimes goes wrong altogether. The main symptoms of bradycardia are dizziness, fainting and extreme tiredness. Once in hospital, Tim had a huge bank of cardiac tests over the next two days before the consultant cardiologist came to see him with his analysis. “He explained the problem very thoroughly. My heart’s own pacemaker, the sinoatrial node, was no longer providing the right signals to initiate enough heart beats. I was going to have to have an artificial pacemaker fitted – the next day,” remembers Tim. The surgery is today very standardised and has a high success rate. Technology has advanced a great deal since the early days of pacemakers in the 1970s and the latest devices are small, effective and efficient. An incision was made in Tim’s chest and the heart pacemaker was implanted, connected up and tested, and then stitches were put in place to close the incision. “I was quite surprised when the surgeon told me that the anaesthetic used is quite light and recovery is good after the operation – I was up and about within an hour of being back to my room and I was discharged the next day. The difference in the way I felt was amazing,” says Tim. Only after the pacemaker was fitted and began to send signals to Tim’s heart to make it beat at the normal 70 beats a minute did Tim realise how ill he had been feeling. “I have always had a ‘carry on regardless’ attitude to life but it really got me in trouble this time. Even though I had just had cardiac surgery, and I did have a bit of discomfort from the surgery, I felt as though I was about 20 years old again. A spring chicken moment, definitely,” laughs Tim. Tim has now had his pacemaker six months and it has been adjusted, as is normal and he is feeling fitter than ever. “I have boundless energy now and I have a new lease of life. I have decided to retire next year – I want to enjoy my new found health. 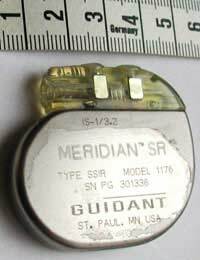 I just have to be careful in some situations – microwaves, mobile phones and airport security don’t mix well with pacemakers but I am going on a European trip next summer. Taking the ferry, of course”, says Tim. I was diagnosed with Takayasus Arteritis 18 years ago,I have had surgery almost every year, sometimes more than once. I have a fully stented Aorta inside of a full length thorasic and abdominal aneurysm of 8 cms, and other stents in my neck and body. I developed AF about 2 years ago, and Bradycardia 2 months ago and was given a pacemaker. I have been kept alive but forget how it feels to be well. I still feel really unwell and very emotional, is this normal following a pacemaker? I had hoped I would be much improved with my pacemaker.